This is my street in Silicon Valley right now. The hazy tree at the end is two blocks away. The hazy chimney over my left shoulder is 3 houses down. Someone just used their air quality instrument to measure Air Quality Index at slightly above 300, classified as hazardous — the worst rating. I need to upgrade my face. These masks are too uncomfortable. And my home. Any suggestions? Someone suggested these scarves with activated charcoal filters. They are selling out fast. First of all, stay inside! Even just being inside a house or a car with no fancy filters will result in slightly better air quality than being outside. It's really hard to effectively filter wildfire smoke out of the air. You'll need a HEPA filter in order for air filtration to do any good. And even a whole-house HEPA filter will only be moderately effective because your house contains a lot of air and is very leaky. This is what I did last year when Portland was full of smoke (that's the air filter I have) and it brought me some relief. But honestly, if I lived in the Bay Area right now, I'd head north or east for a while and try to escape the smoke altogether. There's only so much you can do to mitigate it while you're in it. Don brought his air quality instrument to work today and measured the air outside at 300 and in his Tesla Model X at 8. He thought about driving to Flickr today where they have big bay doors in their offices, driving his Tesla inside, plugging it in, and letting it run. So I've been running this in our office because I have no control over the filters and the smoke inside was getting so bad that I was getting a headache. Super low tech but also very effective. That was great, Toly. It got me to do a sensible thing, which is to go find good air filters for our furnaces. Turns out they're expensive but in a different universe of effectiveness from what we've been using. Thanks. So I searched everywhere for these in the SF Bay Area and all the stores are sold out. At Amazon, there was only one I found that could deliver tomorrow and it was $619. But it gets great reviews and is big enough for 1,100 square feet, which is essentially our upstairs, so I bought it. Wow. My father was a mining engineer and he railed against the EPA. He would tell me about the Four Corners Power Plant in the desert, which had done the area so much good because of the ash that was spread across the plants of the desert, making them flourish like never before. It was great fertilizer for them. I wish you well in trying to stay alive and well from all the smoke pollution. Sometimes in Austin we will get smoke pollution from fires from Mexico, Yucatan Peninsula and Central America from farmers burning their fields to revive its nutrients for the planting season. Many years ago I purchased two large rectangular cube type HEPA air filtration units for the house to see if allergy type symptoms might be relieved. We did not have any type of visible smoke as you are now having. The end result is we thought we felt better, nothing dramatic. The downside is having to replace the expensive filters. I think it cost over $200 to change the filters. Ours had two filters. One, a pre-filter and a second activated charcoal filter. These had to be ordered versus going to a hardware store. If you ran the filters 24 hours a day, filter changes came frequently. Over time we stopped using them and gave them away. Our air situation was not as dire as yours. Several years ago I started using a high quality air filter for our ac/heating. When changing the filter, one can see what is taken out of the air which is a good thing. I am sure it makes a difference in the long run. Maybe it is similar to taking vitamins? It's a good idea but the results may be subtle and long term, again, a good thing. It is strange. I usually see other kinds of embeds including this one. I went back up the thread (that flickering jump glitch is still occurring) and the original embed is still blank, but this is the first time I have seen this that I recall. I have a twitter account and I am logged in. Is a twitter embed different in some way from other embeds? There is an ongoing Kickstarter campaign by a company that has existing previous generation purifiers, but this new stuff looks better looking forward. So sorry about all the fires and devastation in your area, as a former volunteer forest SAR team member, I have an idea or two what that means on the inside. We were dealing with the same issues this fall in Alberta, Canada. The news was saying that dealing with the poor air quality from forest fires was becoming a new reality and part of 'regular' life now. Climate change is exacerbating the situation as is trying to keep too much of our forests from ever burning. Interesting. After some drama from Amazon, I cancelled our $629 filtration system order and decided to go with your solution. But then Amazon suddenly surprised us with the unit so I turned it on tonight. It has some unexpectedly convenient features. For example, it has an air quality sensor which it displays on top as green, yellow, or red. It automatically adjusts fan speed for the air quality. Our house was in red but after a few hours it switched to yellow and slowed the fan. The filter is like 3" thick and has loose pellets inside. After you have had some experience with this filtration unit, it would be nice to hear your thoughts on it. Initially, we had our two in large areas in the house. At night, we would wheel them into the bedrooms and repeat the process the next day. Eventually, we left them in the bedrooms and used them mainly at night. I imagine once you get past the forest fires, then a more normal filtration routine will evolve versus living in a crisis breathing environment. Cal men's basketball canceled their game last Thursday due to smoke seeping into the arena, the Big Game has been pushed out to December 1st, and with Stanford men's and women's basketball cancelling their games over the weekend, Cal women's basketball took advantage and played a home game at Stanford on Sunday. It's been crazy. I don't have much advice on masks, but figured others would find this musical chairs action interesting. They look so much better than the porous filters that we traditionally used, which appear to catch dog hairs but not much more. However, they don't look like they seal well. They just kind of lie loosely on a piece of metal with air gaps surrounding the edges. Honestly, the main thing about the standalone air purifier we bought for $630 is the filter cartridge itself. It's 4 inches thick and apparently contains more than just the paper these furnace filters contain, I don't know what. Maybe the best idea is to fit our furnaces with advanced air filters? What do libraries do? I noticed on the air quality maps that they were listed as havens for bad air. I don't see Twitter embeds either in Firefox (Win), but they are visible in Chrome. It's systematic. I run AdBlock Plus and Privacy Badger, but even whitelisting Cake makes no difference. I'm not a Twitter user. Sometimes I see them on other sites, but sometimes not. FYI. On your crushed/split filter end, seal rips with some type of tape and should work fine. The gaps under the filter as it sits on the filter holder may be due to the filter getting possibly getting bent in shipping? My filters are held down by a couple of spring wires that crisscross across the top of the filters. If your gaps do not disappear once they "settle in", I will suggest getting some wide painters tape(low adhesive) to run along the filter and holder to seal the gaps. 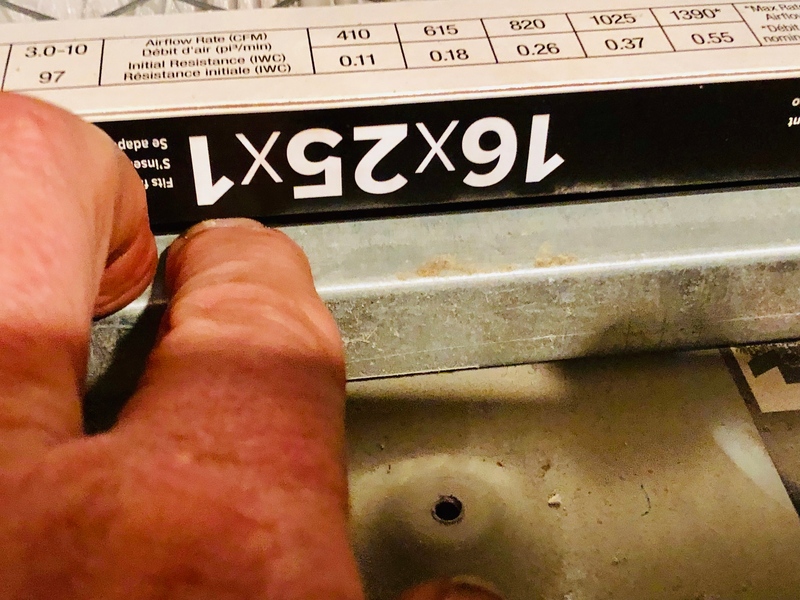 On areas of the filter that are hard to reach once filter is in place, I will suggest placing tape on those areas of the filter before you set it in place. Place the filter in place in hoping the tape will settle down to seal and then place tape around the filter edges you can reach and see there is a gap. The painter's tape is the key so that you don't have adhesive goo remaining when you change the filter the next time. I think the best filter for my ac/heating unit costs in the low twenty dollars for the highest rating filters. On your stand alone filters, my guess is on at least one side there is a filtration paper. On the inside will probably activated charcoal nuggets. There may be some molecular sieve pellets to remove some humidity? I use to maintain scuba diving air compressor filters at a dive shop where I worked. 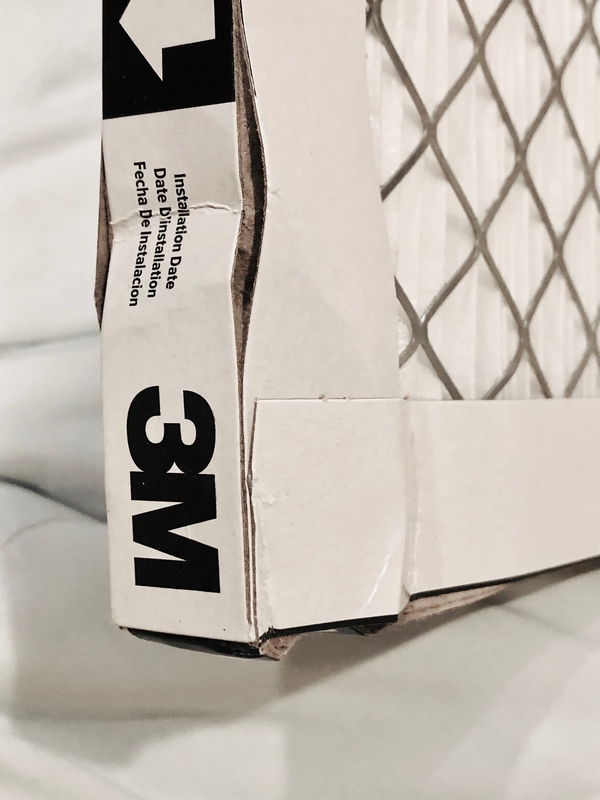 The filters used cotton to filter air particles, molecular sieve to remove moisture and activated charcoal to remove volatile organic compounds (VOCs), odors, and other gaseous pollutants from the air. Periodically, we would receive a laboratory test kit to take air samples from the compressor and also the ambient air. These samples were sent away for analysis. The filters performed very well. Our compressor was near a shopping center parking lot and about 300' away from major streets. The pollution created by the cars was filtered out by the compressors filters. I think your ac/heating filter will work. Sometimes the size filter I needed was not in stock. I took a filter that was one inch longer than what I needed and cut two slits one inch apart in the cardboard frame on both length sides of the filter. This permitted me to collapse the filter down by one inch in length by pushing the ends together. The filter seemed to work fine. A concern on filters is that it needs to allow a certain amount of air to flow through it so that the ac/heating unit can perform as designed and not cause your fan unit to work too hard. I do not have the knowledge about what these limits might be. Originally, I use to use the common fiberglass fiber filters. I just put the higher quality filters in and observed if they worked okay. They have. So I guess the install is a little bit complicated. Do we know anything about how good these are? I do not know anything about these filtration units. I would try to compare the filtration of the replaceable ac/heating filter, your stand alone unit and the electronic units to each other to see which best fits your needs. Reading Amazon reviews might be helpful in knowing what problems might be encountered. Talking with people that actually repair these electronic units will clue you in on things that usually go wrong and maybe what the best brands/models are ? Will still be interested in your findings once you settle in on a solution for your family!